Allu Arjun’s action entertainer Naa Peru Surya Naa Illu India ready to rock the silver screens tomorrow and the expectations raised high on the movie. Bunny fans are eagerly waiting to beat the BAN and Rangasthalam records. Anu Emmanuel playing the female lead role opposite Allu Arjun. 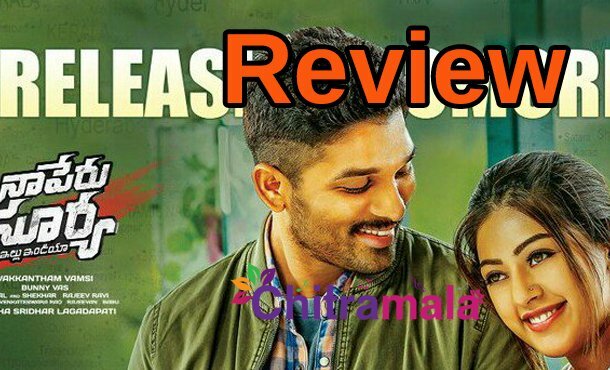 The first review of Naa Peru Surya Naa Illu India is out not and it gets 3.5 rating. UAE censor board member and film critic Umair Sandhu posted the review on the social media page. “EXCLUSIVE First Review #NaaPeruSuryaNaaIlluIndia from UAE ! Paisa Vasool Entertainer all the way. @alluarjun gave Top Notch Performance & He Steals the Show all the way. Terrific Action Stunts, Direction & Rocking Music !! Go for it ! 3.5*/5* ￼￼,” he tweeted. Allu Arjun is playing the role of an Army officer and the impressive love track between Bunny and Anu will be another highlight for the movie. The songs already out and also getting good response from audience. Naa Peru Surya directed by writer turned director Vakkantham Vamsi and produced by Nagababu and Sridhar Lagadapati. Bollywood composers Vishl Sekhar scored music for this flick. The film has actors like Arjun Sarja, Sarath Kumar, Rao Ramesh, Nadiya, Anoop Singh Thakur, Vennela Kishore and many others in other lead roles. Watch out this space for a full review of NSNI.